On Friday morning we left Moab first thing in the morning. It had rained overnight so we had to pack up wet. Luckily we had enough room in the van to keep the wet tent away from our other gear — and it dried quickly. We had a long day planned: Capitol Reef, Bolder Mountain, Escalante Staircase, Red Canyon (skipping Bryce for the moment), and aiming at our next camping stop near Glendale, UT. We drove back up to the I-70 from Moab and headed west, past the Green River, and turned off south on UT24. Again not the fastest route to Capitol Reef but the most scenic. 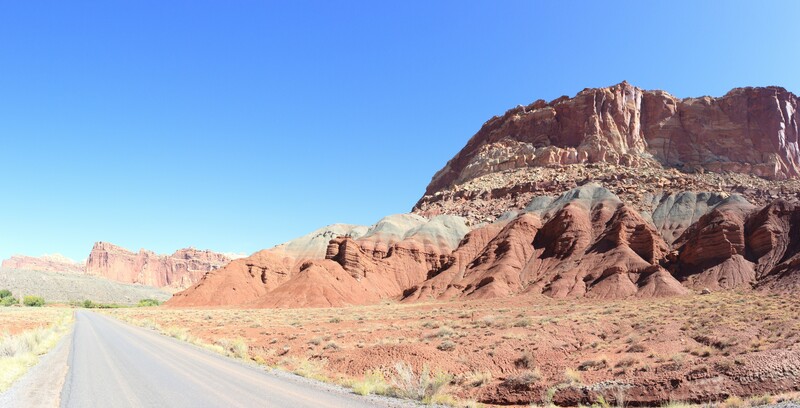 UT 24 travels parallel to the San Rafael Swell and sweeps by Goblin State Park. The swell contains these marvellous saw back formations along the a block fault — if you’ve seen the Star Trek episode where Kirk fights the Gorn, you’ve seen these formations. We did not have time to drive close enough for a good photo! UT24 veres westward at Hanksville. From Hanksville you can see the northernmost shoulders of the Henry Mountains (photo below). UT24 then follows the Fremont river and progressively enters a deepening canyon as you approach Fruita (UT not CO) and the Capitol Reef. 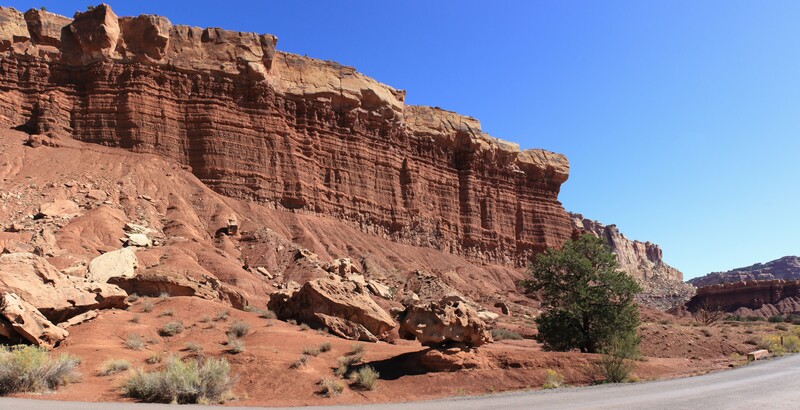 We took the scenic road in the Capitol Reef National Park, but did not take the wash/road into the Capitol Dome area. The weather was good, but we did not have time for a deep excursion. None the less, I was able to get some nice photos of the Reef.